“So then, as we have opportunity, let us do good to everyone, and especially to those who are of the household of faith” (Galatias 6:10). Today at Tunkhannock Baptist Church, we took up a special offering for the Haiti Disaster Relief Fund of Compassion International. We as a church felt compelled to give of what the Lord has given us above and beyond what we normally collect to help the relief efforts in Haiti. And as a Church, we are concerned no only about the physical needs of those in Haiti but also the spiritual needs of all those suffering there. The needs there currently are incredible. But, it is good to remember that the needs are great everywhere. Don’t let Haiti allow you to forget the rest of the world. I know the situation in Haiti is awful. But the situation around the world is awful in general. Don’t let a major disaster be the only time you pray for a nation or a people or give to support the physical and spiritual needs around the world. For instance, did you know that 90% of towns in Russia still are without a church and that most people are barely able to scrape by with enough funds for basic necessities? How could you help in church planing efforts in Russia and meeting the needs of people there? Even closer to home, do you know that in 2005 there were almost 1 million abortions in the US? That’s 1 million people dying (by murder no less) each year in the US. How could you help women choose life over abortion? Those are just two examples of huge needs in two different areas of the world. Let’s be careful not to allow a major disaster to draw our attention away from the rest of the world. While the need in Haiti is incredible right now and the people there need our love, care, support, and prayers (which is why our church is giving funds to help!) it does not mean needs have ended elsewhere. Be informed of the needs around the world and as you are able, do good to all men, especially to the household of faith! Raised with Christ: How the Resurrection Changes Everything. By Adrian Warnock. Wheaton, IL: Crossway, 2010. Warnock has authored a fascinating new book on the resurrection of Jesus Christ. But not just the resurrection, but on the importance of the resurrection. The book deals with how the resurrection of Christ affects absolutely everything. There have been other books written on the historicity of the resurrection, the theological importance of the resurrection, and other concepts around the resurrection but Warnock has helped those who are simply striving to live the Christian life in the pew to understand how the resurrection affects everything. And he does this admirably. As the Western Church has in some areas denied the resurrection and the rest have often denied the power of the resurrection, it is so important to be reminded of the what and why of the resurrection of Christ today in our churches. Warnock begins his volume with the standard fare of treating the historicity, the understanding of resurrection in the time of the Old Testament and New Testament, and some of the initial theological implications of the resurrection. But Warnock’s book begins to really resonate when he begins dealing with the neglect of the resurrection in the church. “To only think of Jesus as a long-haired, gentle man in a robe and wearing sandals has devastating effects on the church…. The world seems blind to the Bible’s description of the resurrected Jesus, full of power and authority” (p. 68). It is true the resurrection has never left the church but we may not always give full credence to it and to its effects in the life of the Christian and the church. It is amazing. The resurrection does not just promise us eternal life, but is the basis for all of the above realities in the life of the church and the Christian and this simply from the book of Acts! Warnock moves on to treat other theological realities in the life of the Christian and the church that have results from the resurrection that we don’t always make connections: justification, sanctification, prayer, revival, glorification and other important areas in our Christian lives. Do we, for instance, believe in the resurrection as only once happened and never again, or do we believe that the Lord revives dead hearts to life? Do we pray to that end just as those in church history did for revival? “Where are the miracles? Where are the salvations? Where are the damatic acts? Where is God? The answer is, he is still here, he is still in the business of bringing life where there is death, and he still is the One who answers by fire. As churches we can ask him for the fire of revival… (p. 179).” Where indeed? The resurrection not only is the promise of our eternal life but is the promise of God that He is still in the business of resurrection! This book is one of the most important, in my humble opinion, ever written on the topic of the resurrection. It is not that Warnock has necessarily said anything that has not been said before in different places and in different ways. Instead, the value in the book is that Warnock has made the sort of hum-drum reality of the resurrection come to life for the church and the Christian! The resurrection of Christ, far more than just some historical event, has ongoing ramifications in the our lives today! The resurrection has great implications for our lives and we fully grasp the nature of and importance of the resurrection of Christ it will profoundly change our lives. That is where this book is so important. It makes so much of the resurrection! And rightly, we should make much of it. Hopefully this book will drive more preachers and teachers to talk about the importance of the resurrection. I heartily recommend Warnock’s book to this end. May the resurrection again be a topic of constant address in the church and may we live like a community brought from death to life in our own resurrection! For more information on this book see the website that goes along with this book, www.raisedwithchrist.net. 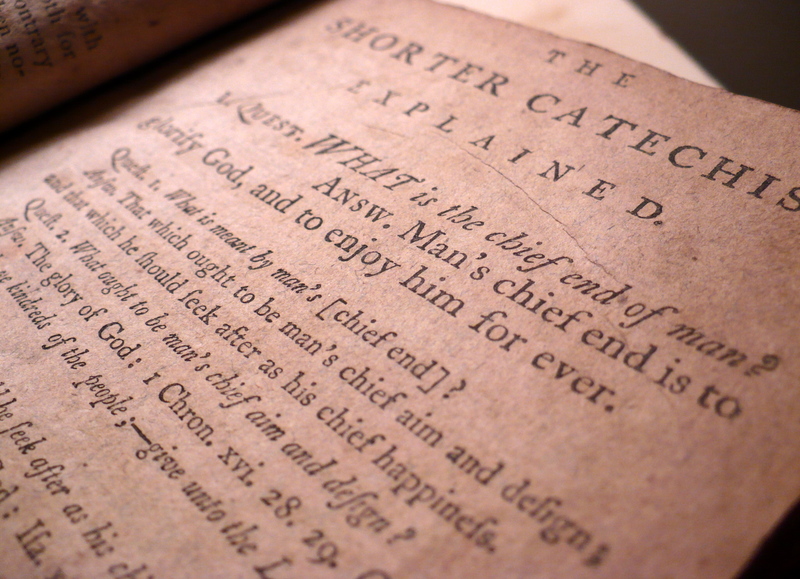 What is a Catechism and Why Use it in the Church? In each of these verses the Greek word for “instruct” or “teach” is katecheo. From this word we get our English word “catechize.” It simply means to teach Biblical truth in an orderly way. Generally this is done with questions and answers accompanied by Biblical support and explanation. This is catechism is known as “The Baptist Catechism” first put forth by Baptists in 1689 in Great Britain. It was adopted by the Philadelphia Baptist Association in 1742. It is patterned on the well-known reformed Westminster Catechism. 1) We are required to “continue in the faith, stable and steadfast” (Col. 1:23). 2) We are urged to “attain to the unity of the… knowledge of the Son of God…so that we may no longer be children, tossed to and fro and carried about by every wind of doctrine” (Eph 4:13–14). 3) There are many deceivers (1 John 2:26). 4) There are difficult doctrines “which the ignorant and unstable twist to their own destruction” (2 Peter 3:16). 5) Leaders must be raised up who can “give instruction in sound doctrine and also confute those who contradict it” (Titus 1:9). You are currently browsing the Working out Salvation with Fear and Trembling blog archives for January, 2010.